Shuafat Ridge, East Jerusalem—It’s not yet summer when I arrive in East Jerusalem during a broiling heat wave. In the area known as Shuafat Ridge, bitter fights break out between neighbors this time of year, when water becomes more scarce and the neighborhood is rife with accusations of water theft. 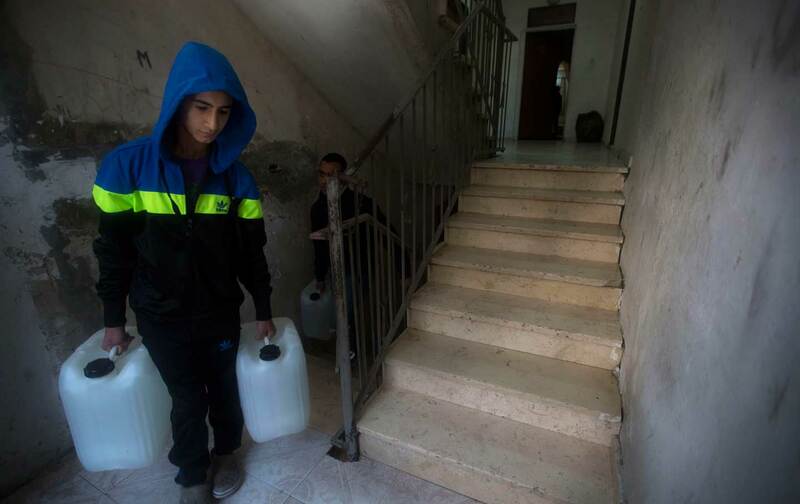 The tens of thousands of Palestinians who live here use around half the amount of water recommended by the World Health Organization—and they struggle to obtain even that. In fact, the relentless scarcity of water in Shuafat Ridge is integral to Israel’s larger strategy for East Jerusalem. In the mid-1970s, the director of policy planning for the Jerusalem municipality, Yisrael Kimhi, explained that “one of the cornerstones in the planning of Jerusalem is the demographic question.” The “demographic balance,” as it’s more frequently known, refers to the conclusions of the Gafni Committee, which was established in 1972 to determine development in the city. Adapting the committee’s recommendations, the government eventually decided to maintain a 70-to-30 ratio of Jews to Arabs in Greater Jerusalem. Throughout the tenure of Teddy Kollek, who served as Jerusalem’s mayor from 1965 to 1993, the government adopted a policy of neglect toward East Jerusalem to meet those recommendations—an approach acknowledged by Kollek himself as well as former city employees who served under him. And like nearly everyone else, Abu Adam’s water connection is considered illegal. It’s hooked up through an improvised system designed by resourceful residents: From the 200 meters that are connected to the central water supply, a spidery network of skinny plastic tubes stretches toward the surrounding apartment buildings. Small motors propelling the water are scattered throughout the neighborhood. But even with this impressive home-grown system, the three kilometers of pipes at the bottom of the valley are not sufficient for the whole camp. People who live at the higher elevations are the last to fill their tanks with water—if there’s any left. Whether in the West Bank or Jerusalem, Palestinians’ right to water has been reduced to a “right” to purchase water from Israel—which not only maintains control over all natural resources in the region but refuses to allow Palestinians the water connections that are routinely granted not only to Israelis inside Israel but to illegal settlements as well. For Palestinians in Shuafat Ridge, even this right is compromised by Israel’s goal of demographic dominance. Charlotte SilverCharlotte Silver, an independent journalist based in Oakland, California, was formerly based in the West Bank.